In 2013, Franklin was awarded champion stallion in KWPN and later on he won the Dutch performance test. As a 5-year-old, he was a finalist at world championship for young horses and also participated as a 6-year-old. He is by the internationally known stallion Ampère, who impresses with his offspring all around Europe every year. In 2008, Ampère was champion stallion in KWPN and later on he won his performance test. His sire, Rousseau, won silver at the world championship for young horses in Verden 2003 and has been able to sire the champion stallion in KWPN three times in a row. The dam sire of Franklin is the Grand Prix stallion, Ferro, which competed at the 2000 Olympics and the European championship under Coby van Balen. As Franklin is line-bred on two of the major Dutch breeding magnates Ferro and Flemmingh, Franklin is an interesting stallion with a big future in both sport and breeding. The offspring by Franklin show a high dressage potential. Several of his offspring have inherited his beautiful expression and great movements with active hind legs and a strong top line. 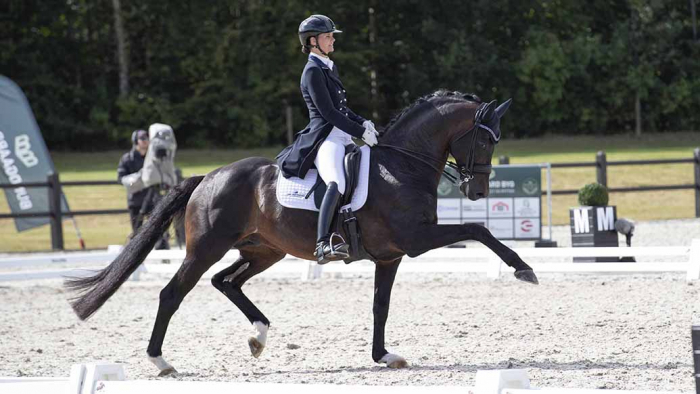 Several of his offspring are sold for top prices; one of them is Faretti DWB (Franklin / Don Frederico), who was awarded DWB Champion Dressage Filly 2017 and sold for 150.000 euro in the Nordic International Sales during Equitour Aalborg in 2017. In 2016 Franklin also sired the DWB Champion Dressage Filly, Francisca Lightfoot and in 2018 the full sister to Faretti DWB, Faretti II DWB was sold for 102.000 euro in the Nordic International Sales. The first sons by Franklin have been approved and the reserve champion from the 2018 KWPN licensing, Kadans (Franklin / Jazz) is one of them. He is a very interesting young stallion who is also a part of Helgstrand Dressage and Paul Schockemöhles stallion 2019 collection. Franklin is licensed in DWB, OLD, HANN, KWPN, WESTPH, Süddt. Verbände, Mecklenburg, Rheinland. Franklin is stationed at Helgstrand Dressage.